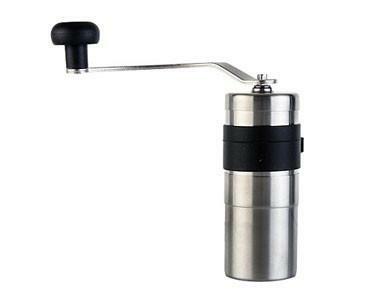 Porlex Mini – Hand Grinder | Small Batch Roasting Co. The Porlex Mini Coffee Grinder has ceramic burrs and a stainless steel housing, which not only makes it easy to clean, but more resilient than glass burrs, and produces less static than plastic burrs. The conical ceramic burrs don’t rust, are easy to clean and stay sharper for much longer than steel burrs. It has a capacity of 26g whole beans. It also has a rubber grip that makes grinding even easier and allows you to attach the handle to the side of the grinder housing when detached. This model fits nicely into an AeroPress with the band removed. As the burrs cope well with everything you can throw at it – from Turkish to French Press grind setting – and thanks to an easily accessible locking nut, is really easy to adjust.